New Extreme Right Book out – soon? Over the last seven years our so, much of my research has focused on the voters of the Extreme Right in Western Europe. Last November, I submitted the final draft of a monograph on that topic to a well-established German publishing company, with view of getting the book out in late January. Then, a lot of things happened (or rather failed to happen). 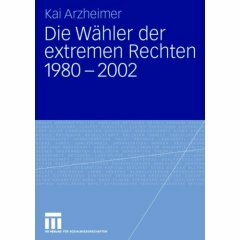 But, believe it or not, yesterday they sent me the contract, and now “Die Wähler der extremen Rechten 1980-2002” is officially in print. I’ll keep you posted.